About 20 years ago I stumbled on a little recipe booklet for skin care in a health food store in California. I leafed through it and my heart leapt. It was a defining moment for me. I instantly realized how making my own skin care products would bring me joy and satisfaction. As I had always enjoyed cooking good food for family and friends, I saw that creating fresh food for the skin was something I would enjoy equally. I have been “cooking and creating” skin care products from organic and natural ingredients ever since… Initially I just made creams, oils and ointments for my family and myself. However, as my knowledge and results improved, I knew that I wanted to share this knowledge with others. 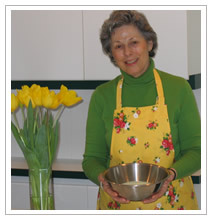 I approached a local Natural Food Market with the idea of teaching “Body Care Cooking classes”. They bought in right away and I taught classes for several years at various locations. I developed a skin care line for this natural food market and then created my own line. These are the products you can now purchase on our website. It was not even that long ago that women had their own recipes for the care of their skin. In antiquity, almond oil, sesame oil, beeswax and honey were used extensively. Facial waters were made from a mixture of almonds, spices, flowers and herbs. Cleopatra mixed her cosmetics according to her own recipes. Ovid, the Roman poet even wrote a little recipe booklet for skin care for the ladies. I believe that Mother Nature has given us everything we need in order to care for our skin. The response to our products from you, our customers, has been overwhelming. It is obvious to me that today many people are looking for skin care products that are made without preservatives and synthetic ingredients. Ours are always fresh and made by hand. We hope that you will enjoy the quality, purity and freshness of our products.